Time Magazine has generally been very successful at dancing along the line between controversial and offensive, but sometimes they overstep the boundaries and publish cover images that genuinely upset portions of their audience. Countless twenty-somethings side-eyed the “Millennials” cover (May 20, 2013) that suggested they were all ungrateful narcissists, while the year before, nursing moms protested the tastelessness and inaccuracies of the “Attachment Parenting” cover (May 21, 2012). 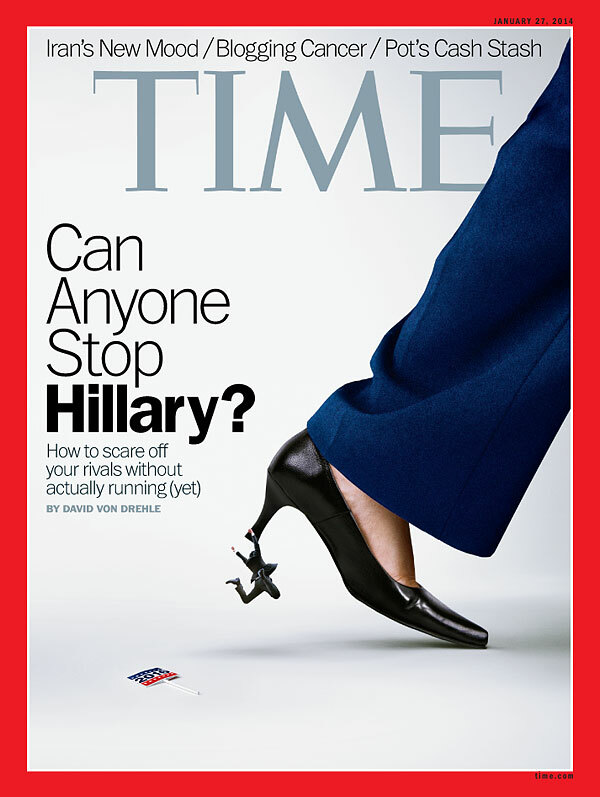 Now, it’s the January 27 cover—a pantsuited leg and high-heeled foot from which a miniature man hangs for dear life, captioned “Can Anyone Stop Hillary?”—that’s causing a stir among feminists everywhere. There are any number of problematic elements here: the implication that navy slacks and kitten heels are inherently feminine; the disproportionate size that make “her” seem like some Godzilla-esque monster terrorizing the city; not to mention the decidedly male figure that clings to her shoe. When asked by Andrea Mitchell of MSNBC about the decision to include the man, Time’s managing editor Nancy Gibbs explained that they “could’ve done any number of men or women who might be trying to catch up to her and slow her down”—right, but you didn’t—“but what we looked at in the story is just how hard it will be for any Democrat looking to block her path to the nomination to stop her.” Notice, Ms. Gibbs, how the term “Democrat” is genderless. She went on to emphasize the “really unique advantages that [Clinton] brings” to the political table; but if that’s the case, if this Uniqueness of hers was such a valued element of the story… then why is nothing about the cover image unique to Hillary Clinton? A blue pant leg and shiny high-heel does not a fierce and important political figure necessarily make (just ask Wendy Davis), and the fact that you can find similar stock images with a simple Google search (which has been done in the past) blatantly clashes with most of the message that Gibbs claims to be going for. When publications like Time frame that feminist [presidential] pursuit with images of women in pointy heels that leave feminized male “victims” in their wake, they undermine the female politician’s power even as they attempt to acknowledge it. No one would dare, nor has anyone dared, to make a statement like this about any man running for office. A journey through the Time archives shows past covers on which the faces, even full torsos, of then-presidential candidates like Mitt Romney, George W. Bush, and Bill Clinton are displayed alongside headlines that boast their strengths and accomplishments or something witty about the latest controversy. None of their identities are reduced to a single generic limb, let alone with a tiny woman clinging to the bottom of their loafers. It doesn’t seem like rocket science that if you intend to discuss what makes a particular human being so special, it might make sense to actually feature them on the cover. A brief glance at January 27’s images will give you only nonspecific answers concerning its subject—it suggests women rather than woman—and for a visual representation of a story about her uniqueness and remarkable political advantages, Hillary Clinton deserved better.